The KBP-V60GTR-C features dip-switches to customise your layout with additional key caps to match your preferred layout, a key puller to help swap your keycaps, and Gateron Blue switches. I have been looking for a small portable mechanical keyboard for a while now as I've been using a full-sized one at home for a couple of years. A mechanical switch responds and feels so much better than a regular rubber dome switch. I was torn between this and the FFKB68MCUKB which featured a UK layout and Cherry MX switches, but was larger in overall size and more expensive. 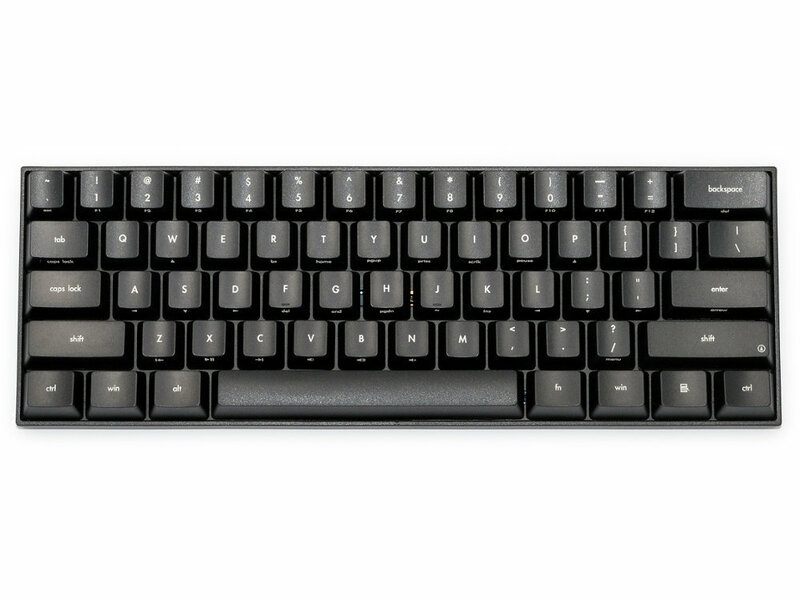 After looking at an independant review between the Cherry MX and Gateron switches, the conclusion was that they might as well come from the same factory, as everything was the same except the colour of the casing. I decided to go for the KBP-V60GTR-C as the US layout wouldn't be such a big deal to me, but I needed the smaller size. The keyboard comes with a key puller which does the job, but it's a little chunky and not long enough to get both clips under all the keys. It also comes with a USB cable and alternate keycaps. The blue switches have a great click sound and tactile feedback so there's no need to follow through and bottom out the keys, which is something you'd might have to do with white, red, yellow, and black switches to be sure you've pressed it. For the tactile feel without the click there's always the brown switches. The alternate keycaps are useful as I need to access the esc key more than the ` and ~. Same goes for swapping the caps lock for fn (function). The dip switches on the back of the keyboard help with changing which keys do what, as illustrated in the included manual. However, I have found these little dip switches to be less than willing to stay in one place when in transport. My overall review is 5 star, but the little dip switches that managed to change themselves removes a star. If you're new to mechanical keyboards, and even the mini ones, consider this one as you've still got all the keys as a tenkeyless by using the function (fn) button(s). Huge thanks to the Keyboard Co for supplying such a great selection of boards.